The 2014 Team Ohio 4-H Nationals Shooting Team. Hoppin ‘n’ Trottin 4-H Club Advisor Tom Baker instructs members on how to clean a gun. Baker said safety is always a priority. Hoppin ‘n’ Trottin 4-H Club member Jillian Speer takes aim during practice under the tutelage of advisor Tom Baker. SWANTON – Sharpshooters from 4-H clubs across America will strut their prowess at a national competition next week, and Swanton’s Hoppin’ N Trottin’ chapter is no exception. Twelve members will travel to Grand Island, Neb., for the 4-H Shooting Sports National Championships June 22-26. They will be among 28 youth representing the State of Ohio at the event. It’s the fourth year some of the 70-plus members of the Hoppin’ N Trottin’ 4-H Club will participate. Those attending are volunteers who selected from nine of the competition’s disciplines. Those include air rifle, compound, recurve archery, muzzle loader, rifle, and shotgun. 4-H members can participate in an individual discipline only once. They must choose another if they attend the following year. 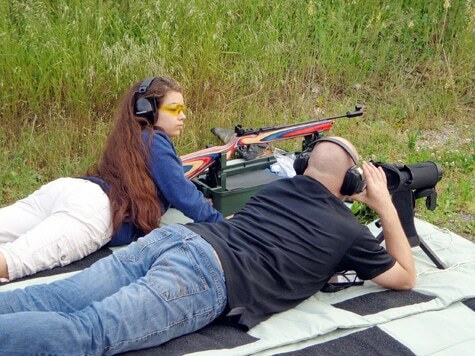 The club’s advisors, Tom and Kim Baker got the youngsters involved in the championships after a shooting club they attended locally ceased operations. The Bakers became certified instructors in the sport so the members could continue. The first year Hoppin’ and Trottin’ attended the competition 12 members volunteered. Member Ethon Pawlaczyk placed third overall in the nation 2013 in hunting and wildlife, and the team in that discipline– Hoppin’ and Trottin’ members TJ Baker, Michael Baker, and Zac Cohen from Cincinnati–placed fifth in the nation. In 2014, member Hannah Stinson placed fourth in the nation for hunter decision making. The competition uses paper and clay shooting targets, and three-dimensional foam animals for archery contests. Each 4-H team consists of three or four members. Winners receive medallions. All participants must wear hand and eye protection and follow 4-H safety guidelines. In order to attend the championships, 4-H members must be 14 years old by Jan. 1 of the year. Baker said while some Hoppin’ and Trottin’ members aren’t yet old enough to attend the national event they’re good enough to compete. “We think all the kids are outstanding. All the kids have a fair chance,” Baker said. The club members practice regularly at the Fulton County Sportsmen Club, the Izzak Walton shooting club on County Road H, and Cleland’s Outdoor World in Toledo. The club’s archers practice at the Wildwood Bowmen Club in Delta. Attending the championships isn’t inexpensive. Hoppin’ N Trottin’ members have raised $4,260 for registration fees alone, and still need funding for transportation and gas. To keep costs down they stay at a KOA campground and prepare their own food. The group is seeking sponsors to pay for matching T-shirts. Next year, the club will submit a grant proposal through Friends of the NRA. “Anything we get donated just helps provide any last-minute items we need,” Baker said. He said they’re collecting donations right up to this weekend, when they leave for the championships. This will be the final year 18-year-old Hoppin’ N Trottin’ member Ethon Pawlaczyk competes. Last year, he served as Ohio’s ambassador. His interest in shooting took hold eight years ago, when his grandfather taught Pawlaczyk and his cousin how to shoot his pistol. “After that, I couldn’t get enough,” he said. He owns several guns, including his grandfather’s pistol. He hopes to begin entering adult shooting competitions, saying the sport teaches social and life skills, including how to win and lose. Anyone wishing to donate to the Hoppin’ N Trottin’ 4-H Club can visit gofundme.com/4-hteamohio.